For more than a quarter century, the United States has been mired in a global trade imbalance that has led to a consistently rising current account deficit. An overwhelming dependence on foreign oil combined with insatiable consumer demand has driven the trade deficit to record heights. Despite significant declines in the value of the dollar and steady export growth, the U.S. current account deficit has grown from $140 billion to $739 billion, a 426% increase in the past ten years. The accretion of nominal deficits, however, does not tell the whole story. 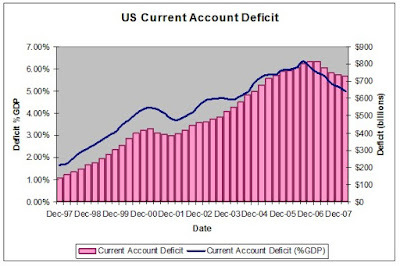 The U.S. current account deficit as a share GDP has risen from 1.7% to 5.3% over the past decade, further exemplifying a growing dependence on foreign goods and an inability of the U.S. economy to meet the demands of the consumer. Trade imbalances emerge when domestic demand exceeds the productive capacity of the economy. Consumers resort to imports in order to alleviate deficiencies in domestic production resulting from an insufficient investment in capital or an inadequate labor supply. In the short run, the productive capacity of an economy is constrained by its endowment of capital and labor. Incremental short term improvements in labor productivity can be attained through longer working hours, but these gains are generally temporary in nature. Capital, on the other hand, requires long term planning as it takes years to design and construct new office buildings, production equipment, and manufacturing facilities. While differences in consumer preferences and comparative advantages lead to trade among nations, large persistent trade imbalances point to excess consumption and insufficient investment. A trade deficit should not, on its face, be considered unfavorable, but one that finances consumption demand as opposed to investment portends an inevitable day of reckoning. For the U.S., that time may have come. Years of inadequate domestic investment in energy exploration and production has resulted in a dangerous dependence on foreign sources of energy. Whether it is opposition to offshore drilling, a reluctance to build new refineries, aversion to coal fired power plants, or trepidation about nuclear energy, the United States energy policy has been held hostage by lobbyists and opposition groups that have derailed efforts to craft a national energy policy. The environmentalist lobby prevented meaningful debate about a comprehensive energy policy and squashed President Bush’s proposals in 2002 that would have substantially increased domestic energy production, alleviating much of the current global supply inadequacy. More than six years of inaction have been marked by discarded plans for multiple coal fired power plants and oil prices that have increased more than 500% since the national energy debate was suppressed. The United States spends between $600-700 billion per year on imported oil, representing virtually the entire trade deficit. Oil imports do not increase domestic productive capacity, but instead are symptomatic of the inability of the United States’ energy infrastructure to meet the needs of consumers. If politicians continue to forsake the best interests of the nation in favor of environmentalist opposition, the United States economy will be crippled by skyrocketing energy prices, soaring inflation, higher real interest rates, and continued weakness of the dollar. Failure to embark on an aggressive and realistic plan towards energy independence will perpetuate the extraordinary transfer of wealth to oil producing nations, threatening the future of the U.S. economy. Congressional procrastination has eroded the standard of living of millions of hard working Americans and depressed economic growth. Further inaction will precipitate the end of U.S. economic supremacy.